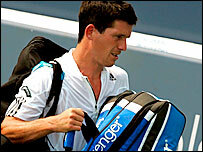 Tim Henman has withdrawn from next week's Pilot Pen event in New Haven because of lingering back problems. Henman, who has lost in the first round of his last two events in Washington and Cincinnati, hopes to make a full recovery in time for the US Open. "It's frustrating because I haven't had that many problems with it all year; in the summer it was fine," he said. "But playing on hard courts is a lot tougher on the body and my back hasn't reacted as well as I would've wanted." Andy Murray has already pulled out of the New Haven event and both Britons are now struggling to regain full fitness before the final Grand Slam of the year, which starts a week on Monday, 27 August. "It's tough to concentrate on winning when I'm worrying about my back so I want to try and get it right as soon as possible," Henman added. "My goal now is to try and get as much treatment on it as possible before the start of the US Open." Henman's latest injury problem has led to speculation he may retire after next month's Davis Cup tie against Croatia. The 32-year-old, who has won just three tour matches this season and slumped to 92 in the world, has reportedly not entered any ATP tournaments after the three-day clash starting on 21 September.